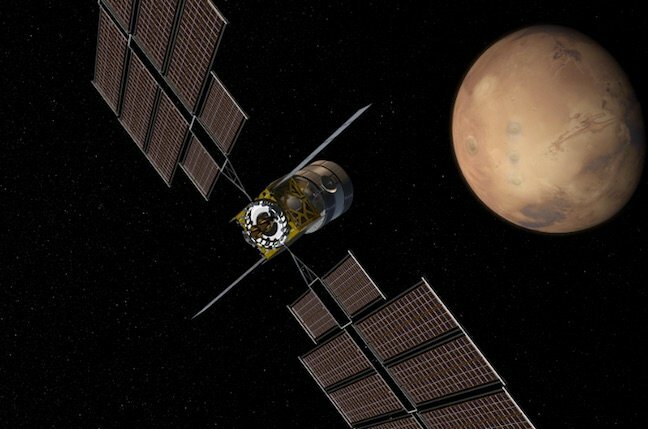 Aerospace outfit Boeing has detailed the hardware it thinks humanity will need to stage a piloted mission to Mars. Boeing is already working with NASA to develop the Space Launch System (SLS), the very heavy lifter it's hoped will power a Mars shot. Now it's also offered up conceptual designs for other kit that it thinks will be useful for that mission. First, the “Deep Space Gateway”, a space station it's envisioned will be positioned in Cislunar space, which is to say in or beyond the orbit of the Moon rather than in Earth orbit. Boeing's developed a design for that facility it says could be hauled into place with just four SLS missions. NASA's fact sheet (PDF) for the SLS explains its cargo-carrying variants should have sufficient capacity to launch “a small deep-space habitat module” so we're guessing Boeing's singing from that hymn sheet with variation or two of its own. It's been ages since humans went beyond low Earth orbit so it's long been assumed we'll need to spend some time near the Moon to give deep space tech a good solid shakedown before trying to visit Mars. Boeing's announcements on Monday offer a glimpse of how that might happen, complete with visions of the Gateway as a base for lunar exploration. The Gateway would also be the staging point for the “Deep Space Transport vehicle” that would make the trek to Mars. Whether that's an SLS or something else isn't explained. We do know that both the Gateway and the Transport are real projects being worked on under NASA’s Next Space Technologies for Exploration Technologies (Next Step) program and the High Power Solar Electric Propulsion technology development effort within the NASA Space Technology Mission Directorate.